Yomawari: Can you Survive the Night Alone? The phone rings. You answer and a female voice says, “I’m right behind you”. Suddenly a ghost materializes and chases you. You run, only to be overtaken by the luminescent, ghostly figure adorned in a white flowing dress with hair draped over her face. Not only does this sound like the beginning of a terrifying Japanese horror film, but it also depicts a scene in Nippon Ichi Software’s (NIS) newest title, Yomawari: Night Alone. Yomawari, which means Night Watchman in Japanese, combines typical Japanese cuteness with the epic horror elements the country is known for. Set in a Japanese neighborhood, a little girl takes her dog, Poro out for a walk. She throws a rock in the street, and as the dog goes to fetch it, he is run over by an extremely fast-moving car. When the girl returns home, her older sister assumes the dog ran away and sets out into the night to find him. Swallowed by the darkness of the night, this is the last time the little girl sees her older sister. The little girl eventually sets out into the night to investigate, and becomes a Night Watchman, taking on the ghosts that haunt her small town. To be honest, when the car ran Poro over, I laughed hysterically. From the cuteness level and the immediate and completely random death of the dog, I did not think that Yomawari would have the horror elements I was looking for. However, I was soon proven wrong. During most of the game, you play in silence. All you can hear is your footsteps, which creates a terrifying atmosphere and a feeling of dread and anxiety. You continue walking down the empty streets, only hearing the sound of your footsteps, until you have a feeling that someone, or something, is nearby. Your hearts starts racing and you can hear your heartbeat growing faster and faster. All of a sudden, a spine-chilling ghost pops up on the screen. Fight or flight. Your instincts tell you to run, but you’re too slow. The ghost overtakes you and SPLAT; your blood is splattered on the screen. These effects are an excellent source of horror and the first time I played, I found myself on the edge of my seat, gripping my controller, with my actual heart racing. 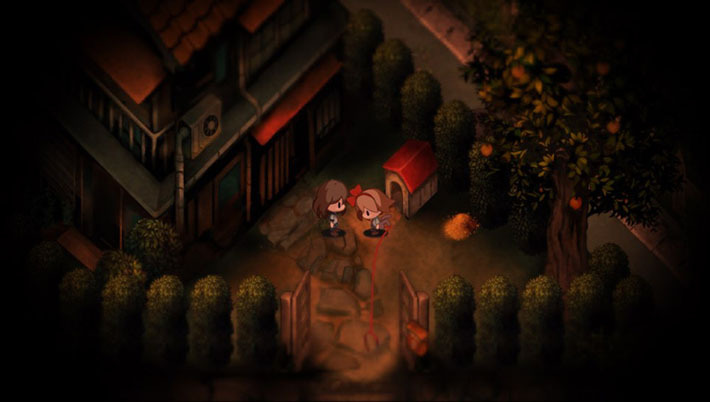 While the effects provide a great element of horror, the ghostly characters in Yomawari and the relation to Japanese stories is the icing on the cake… or the nail in the coffin. Many of the ghosts reminded me of Japanese television shows and movies that I used to watch as a child, like GeGeGe no Kitarō and Gakkō no Kaidan, and reflect many typical Japanese ghost stories and folklore. These include rolling eyeballs, voodoo dolls, bloodied girls, and suicidal spirits. The ghosts are well-designed and also have different characteristics and strategic ways to get past them, including not shining the flashlight on them, tiptoeing past them, and the good ole “run as fast as you can and don’t look back”. The struggle to figure out these strategic maneuvers is both fun and suspenseful. The characters are all also placed in archetypical horror story locations such as the school, park, graveyard, shrine, and train station. Each area introduces new ghosts, challenges and themes, creating excitement and mystery around every corner. These components truly make Yomawari seem like a successful and popularized Japanese horror movie turned game. Haunted by the ghost of Poro, the little girl takes you on an adventure through her town, where you must complete mini tasks in order to progress. 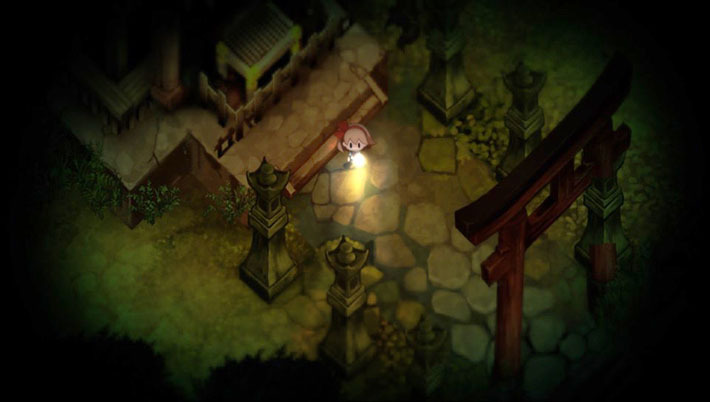 Instead of battling the ghosts like in a typical horror game, NIS created Yomawari as an interesting and fun contrast. You must either avoid the ghosts, or complete tasks to help them. You also get an incomplete map, which you have to fill in by exploring unexplored areas of the haunted town. The town is the perfect size for exploration and there are Jizo statues, protectors of travelers, children and women, which you can use to teleport to areas you’ve already explored. Also, in newly explored areas, you can collect items that may or may not be used to get past certain ghouls or enter more uncharted areas. Sometimes these items are put on display in your house, which encourages exploration and collection. The biggest shortcoming to Yomawari is that it is short. The game is only seven chapters long, which I was able to complete in a little over three hours. The storyline and dialogue however provide little direction on what you need to do next, which makes the adventure slightly more challenging and rewarding when completed. You simply have to figure out where to go, or what items to use on your own. Once you complete Yomawari, you also reveal the answers to the quest and realize an interesting and morbid overarching theme, much like a true Japanese horror movie. You can also play in an “after the fact” free-play exploration mode after completing the main story mode, which lengthens gameplay. Yomawari: Night Alone is a great depiction of the most frightening of frights, Japanese horror stories. NIS vividly combined a vast multitude of Japanese horror stories and characters to create a game that either keeps your hands over your eyes, tightly gripping your controller, or covering your mouth to prevent a scream. Yomawari uses your sense of sight and sound to plunge you into a haunted town and an underlying story of love that you won’t want to miss. The only real question is: Are you brave enough to take on the night alone?